Our Chalkboard stencils are a perfect alternative to chalkboard wall decals! They work great with Benjamin Moore Chalkboard paint. 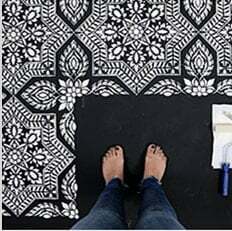 Unlike decals that usually have a very limited color range, this chalkboard paint comes in hundreds of colors so you can choose a perfect hue for your particular decor. Try our fun chalkboard stencils for your next DIY stenciling project!